Truly modern, and absolutely stunning. These modern beauty wedding invites feature an elaborate ampersand design between your names. 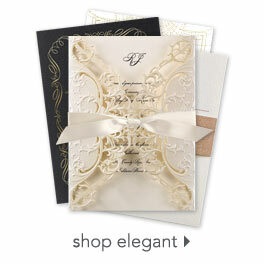 We've enhanced the look and feel of these wedding invitations with ribbon, which is available in your choice of color. A coordinating design appears on the back with your names and wedding date. Design and wording are printed in your choice of colors and fonts. Satin ribbon comes precut and ready for tying around the invitation. Invitation includes inner and outer envelopes. Recieved the invitations pretty fast, I somehow ordered the wrong ribbon color, and freaked out. I emailed the company right away, and they sent the correct color at no extra cost! I had to tie the ribbon around every invite, but it really wasn't that bad. I would say to better label the envelopes. They get mixed up easily, and I had to re-label several once I realized they were the wrong size. It was a very stressful, and upsetting process. I'm very happy to be finished with my invites, and they came out wonderful. I had a lot of compliments! I'm happy with my choice! Overall, I'm happy with them. You do have to put the bow on yourself. If you know someone's who's crafty, that's great. I'm not crafty, so I had to practice A LOT to get it right, but I did it. So they are DIY! But it was worth it, because I received compliments on them! I also did have to buy my own ribbon for the bows, which was a little pricey. I wish they would have had a better variety of colors. I wanted/needed a cobalt blue and the only blue they had was baby blue! Really? For wedding invitations.. Anyway, that's the worst complaint. Thank god it was something that could be easily fixed.